Which type of colleges offer Associate degrees? Will student get financial aid at the PhD level certainly? Not necessarily, since universities may offer admission even without aid too, based on the interest and financial situation of the department concerned. TOEFL or IELTS for English proficiency, SAT for undergraduate level programsGRE for MS programs and GMAT for Management-related programs. What tests are required for MBA admission? Will GRE be accepted for MS admission? For MS in Financial Management, which tests are required? For MS in Accountancy, which tests are required? What is the Test fee of TOEFL? What is the ASR fee for GRE? US $ 20. ASR is Additional Score Reporting, which has to be done by a student if he/she were to send score reports through ETS for additional universities than allowed by ETS. What is the maximum score one can obtain in the AWA section of GRE? What is a good score in IELTS for admission in decent universities? Is IELTS offered as a computer based test? Only every alternate month at other centers and once a month in British Council, New Delhi. What is SAT II Test? Is it mandatory? SAT II Subject tests are offered in twenty different subjects, one or some which are required by US universities for admission into their highly competitive programs, in addition to SAT 1 Reasoning test. When does one start the application process? One should start at least 6 to 9 months before the start of semester. Which is the ‘right’ semester to seek admission? 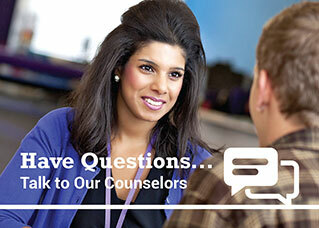 If financial aid is required, when should one apply for each semester? At least 9 to 12 months before the start of semester. What are the different semesters in which admissions are given? Fall and Spring are the main semesters in which most universities offer admission. In many others, admissions are given even during Winter and Summer semesters too. Admission deadlines for each semester? Do all universities follow the same semester system and deadlines? Not necessarily. Each university is independent and follows its own admission policies. Is there a possibility to apply late for some universities? Yes, some universities are flexible and may allow students to apply even two months before start of semester. At Impel, we have many universities that allows late application. If deadlines are over, what will universities do with applications? They will keep the applications pending and consider them for the next semester admission. Online is the best and fastest method to apply. What are the documents required to be sent after applying? Universities generally require transcripts up to the end of third year and even up to end of the 7th semester (Ist half of 4th year). If a student has not sent his/her transcripts accordingly, these have to be sent after applying. What care need to be taken while applying? Name must be given exactly as in the passport. The family name or last name must be definitely included in the applications and must be indicated within the Passport of applicants. What are the essential contents of an SOP? What is the difference between an SOP and an Essay? How many recos. are to be obtained? Who should not give recommendations? Should recos. be sent directly to universities? Some universities always request recommenders to send their recos. directly. Most accept the recommendations’ inclusion along with other application material. However, they must be in sealed envelopes, with the signature of the recommender across the flap of the same, confirming that it was not tampered with. Best way is online, with a credit card. Is application fee waived for international students? When does one start following-up with universities about admission status? After at least 3-4 weeks from applying. How long does a university take to decide on applications? Normally between 2 to 8 weeks, after full application material is received.. When can one expect an I-20 (Letter of Admission) after applying? After at least 8 to 12 weeks. In what ways can Impel help with application procedures? Can Impel help in May/June, for Fall admission? Possible, for some programs, in a few universities. Who are most ideal to issue recommendation letters? Those who taught the student or interacted with him/her during lab work/projects etc. With a three year degree, can one obtain admission in US? Yes, admission is possible in a few programs in some universities. What are the typical programs for which admission may be difficult? Pharmacy, Medicine, Physiotherapy, Law, Dentistry and other clinical programs. How will Impel help students for PhD programs? Unfortunately, we cannot help them directly at the moment. For a fee, Impel can shortlist universities for a given program, at the PhD level. What forms of financial aid are offered by universities? Scholarships, Assistantships, Fee waivers, stipends etc. Which is the best form of financial aid? A scholarship, since it does not require any work in compensation. Is aid offered based on merit or need, for international students? For international students, aid is always offered based on merit and academic performance only. In exceptional cases, very few may be considered for need-based aid, very rarely. What are the minimum requirements considered for granting aid? Excellent academic performance – to be in the top 2-3 of the class and pre-requisite test scores for aid before enrolling.ly. If aid is not available, what other resources are available for international students? What will be the duration of aid? Normally for one semester or year, depending on the type of aid. How is a scholarship different from assistantship? Scholarship does not require any compensatory work, whereas Assistantship (Research, Teaching or Administrative) require work contribution. What is the difference between Teaching and Research Assistantships? In Teaching Assistantship, a student is expected to teach students at a lower level and help with assignments/evaluation of students’ grades etc. A Research Assistant helps his guide in research work. What additional qualifications are required for grant of a teaching assistantship? A good score in TSE, which is a different test from TOEFL. What type of visa should one apply for, if one wants to the US as a student? I am on F-1 visa. Do I have to study on full-time basis? What is SEVIS Fee? How can one pay that fee? SEVIS is Student Exchange Visitor Information System, of the US Government, to keep track of international students arriving in the USA. To administer this service, a fee of US $ 200 has to be paid by each student, who enrolls in a university. What are considered as important by any US Consulate to consider visa issuance for an applicant? If a student’s spouse is interested to join him/her, under what category can he/she apply? What is the exemption for above? When the student is on vacation or the university is closed for holidays, he/she can work full-time off campus. One wants to seek employment, what category of visa should a student who is already in the US apply for? Is ‘change of status’ from one visa to another, possible within US? What will happen if one loses his status of a particular type of visa? The student has to leave USA or he will be forcibly deported back. For what duration is a student visa issued? For the length of the program. Can one change a university after he initially sought admission in another? Yes, with the assistance of International Admissions Officer of his university. If one cannot use the visa for a particular semester, can he/she use it for another? Yes, he/she can defer admission to another semester and use the same visa, if there is no change in the university or the program. What are the financial requirements to apply for visa? What is the present visa fee in US $? In which bank the fee has to be paid? What is the minimum time required to book a visa slot? Two days after payment of fee. When will the visa be granted and how does the student know? Grant of visa will be informed by the visa officer and the student would know during the interview itself. What is the average cost of education and living in USA? $ 20,000 to 30,000 per year. How much money has to be shown for Bachelors level admission? To cover the cost of 1st year education and living expenditure. How much is required to be taken by a student when he leaves for the US? To cover his/her first semester fees and living expenses. At least one year’s costs – both tuition and living expenses put together. For how long a period should one show funds for Masters admission? In order to prove that one is financially sound, how much and what type of sources should one declare for visa purpose? Liquid funds (bank balance) and immovable, revenue-generating properties to demonstrate availability of resources for subsequent use. What are the various sources of funding for studying in USA? Personal;, family, government, university, scholarships, grants and other forms of aid. What are the minimum and maximum amounts considered as loan by banks? While there is no minimum prescribed, the maximum varies from one bank to another. What are the mandatory requirements for sanction of a bank loan? Are there are international loan agencies that provide funding for international students? Yes – plenty of them. What are the normal terms of such loan agencies? Needs just a co-signor, who is a permanent resident of USA. Should a student or his/her parents need to pay interest and principal amount in EMIs during the study period of a loan? Not required. Such payments may be made after six months from the date of course completion or after getting a job (by the student), whichever is earlier. For what requirements are loans given? Both for tuition and living expenses. How can Impel help applicants with financial requirement? By providing information about the funding requirement of universities specifically and by trying to secure financial aid, if possible. Can an international student work while studying in the US? Is the money made on such part-time employment taxable? When can one start working part-time? After registering for the classes. If a student does internship in a US company after education, is that considered as work? Internship is not considered as work. How long can a student stay back after his/her education? If a student works full-time illegally during college working days, what can happen? He may be deported back to his country of birth. What is a Co-op. program? Co-op. program is also known as Curricular Practical Training. Details are available in the ‘USA’ section of this website. Can a student on F1 visa apply for H1b category visa? He can, but without success. Are dependants of such students/employees (F1 and H1b) eligible to work? Just as applicable to the particular category of visa holders. Can dependants study in the US, when they join spouses who are in the US on the above types of visas? Can one apply for a second degree program and continue his/her education after the first degree? Can a student go back to US after he takes a break from studies and visit his home country for some reason? Can one change a university after such a break? Yes the student can do so after proper authorization by his present school/university. Does he have to re-apply for a visa if he changes the university? Not, if he changes after reaching USA. If a student provides false information or fictitious documentation, what could happen to him? He/she will be permanently debarred from entering the US, on the student (F-1) visa. Brexit is the popular term for the United Kingdom’s intended withdrawal from the European Union. In a UK referendum on 23 June 2016, 51.9% voted to leave the EU. On 29 March 2017, the British government invoked Article 50 of the Treaty on the European Union; although revoking this might be legally possible, the UK is thus on course to leave the EU in March 2019. Which degrees the UK universities offer? UK universities offer a huge range of degree courses both at undergraduate (Bachelors) and postgraduate (Masters) and doctoral level (PhDs). Universities also offer a range of access, diploma and other courses, including the new two-year Foundation Degrees. For more information about the different types of qualification contact the Quality Assurance Agency. It is advisable to take University accommodation as a new student you don”t have to hunt much for accommodation, don’t have to worry about landlords & contracts, no extra bills and mostly university accommodations are close in proximity to the place of study. How ever university accommodation has its own limitations the accommodation is slightly expensive, less space, limits things you do (throw parties and make noise) etc. What about research in UK Universities? All UK universities undertake research and teaching, although the mission focus and balance of activities varies. Some institutions concentrate primarily on teaching while others are more research intensive. Universities also increasingly transfer knowledge out to businesses and other organizations. This process is known as knowledge transfer. This table includes the University of Buckingham. There are 114 university institutions in the UK, counting separately the colleges of Wales and London. If Wales and London are counted as single institutions, the total is 89. Currently, several university colleges have applied for university status to the Privy Council. This list excludes providers of foreign providers of higher education operating in the UK. Is there any discrimination towards Indian students? UK is the favorite destination for students from all around the world; with students from various nationalities coming into the UK the law is very stringent in ensuring that no one adapts any sort of discriminatory activities. Added to this the rich cultural heritage of UK has been built on many centuries of relationship with India, which gives a perfect understanding of Indian cultural values and customs. What is the present visa application fee? What is a very important factor for issue of visa? How long will the visa process take? One week to 15 days. Is an interview required for visa? Normally no. But in case if there is a need for clarification or missing documents, visa interview may be called for. Does the IELTS enhance my chances of success for student visa? As proficiency in English is one aspect that affects the outcome of the visa application, IELTS sometimes does have a bearing on the visa prospects of the student. In the absence of an IELTS score the visa officer would base his conclusions regarding your English proficiency on the limited conversation he engages you in and also on your SSLC and HSLC English scores. As these could sometimes portray a picture different from the real one it is strongly advisable for the student to have an IELTS score at least from the visa perspective. If you are unable to submit the score card at the time of application, you would be offered a Conditional Offer of satisfactorily completing the IELTS / TOEFL requirement. What are the criteria for issuance of visa? How do I get a refund of my security deposit if my visa is rejected? The security deposit is refunded only if the student shows the letter of rejection of student visa issued by the British High Commission. In most cases the University refunds the deposit within a period of 1-2 months upon the University receiving the formal letter for refund along with the letter of visa rejection. Primarily, the candidate is expected to have all the required documents in order. Presentation of self is also very important. As the student is going to be tested for his English language skills in a very crisp way his answers need to be precise and to the point. Knowledge of course and University the student is going to is very essential as the student would be questioned on this. General information on UK education, lifestyles etc would be an added advantage. Finally the student is expected to have a clear plan of action regarding his post study plans. How soon can we get a ‘Letter of Offer’? Within seven days to two months, depending upon the university. How much do we charge for admission? Our services are totally FREE OF COST. What is the duration of Bachelors degree? How much does it cost to study MBA? What is the duration of Masters degree? Is GRE required for admission into MSc programs? What are the basic entry requirements for Master’s programme at any University in U.K? The entry requirement for Masters programme at any University in U.K is a good First Class Degree (60% and above) in graduation, in a related stream. Do I require IELTS / TOEFL score to apply to any University in U.K? Applicants with a minimum of 70% in English in Class 12th would not be required to appear for IELTS / TOEFL. However, those with less than 70% would be required to score min of 6.0 in IELTS / 213 (CBT) in TOEFL/79 (IBT) in TOEFL. What is the eligibility for the MBA program at any Universities in U.K? Minimum 2- 3 year’s Full Time work experience after graduation. First class degree in graduation. Age of Boys should be minimum 25 years and that for Girls should be minimum 24 years. For Fresher’s, there are some universities which would give the admissions. For MBA who are from different stream, admission into MS programs is possible. Are there any scholarships available for Postgraduate programme? Most of the departments offer scholarships for postgraduate programme that depends on Universities. Eligible Criteria for getting scholarships is that, “the applicant should have 65% marks in his graduation and IELTS-6.5 / TOEFL -230 & above”. British banks, in common with their counterparts across the globe, have introduced the regulations about opening new bank accounts. Security procedures have been implemented which can lead to delays for overseas students who try to open an account on arrival. It is almost impossible to open a UK bank account whilst you are overseas. As it is very difficult to open a bank account in the UK, its recommended that students have bank account in their home country that has a UK branch or keep their existing accounts at home until they are able to open a bank account here. This way you will still have access to funds. How do we get to know the ranking and accreditation of Universities? Independent and privately-funded colleges and institutions must accredit themselves to the British Accreditation Council www.the-bac.org. Till end 2008, visas were granted to those students who obtained admission in properly accredited universities. Quality Assessment Authority (QAA) – Checks, controls and plans the academic standards and quality of universities in UK. In the UK, universities are subject to strict quality control. As such, there are no ‘official’ rankings given either by the Government or private bodies, since all the universities are considered ‘good’ for education. What is the last date for filing University Application? Most or all of the UK Universities offer admission to students on a first-come-first-serve, provided the student fulfill the entry requirements, hence there is no official closing date for application filing with most of the Universities. As the student is required to get his visa, which might add some more time to the process it is recommended that the student file his application at the earliest by February or at the latest by early July for the September intake and by November for the February intake. An early application apart from enhancing the student chances of getting a successful offer would also give the student the added advantage of applying for scholarships and ensuring the best of accommodation. How should the students pay tuition fee and when? A Tuition Deposit is payable before issue of Letter of Admission. Balance is payable before registering for the classes, after reaching the university. When will an Unconditional letter of offer be issued? Each University course has different entrance requirements and you should your counselor at Impel for information on the entry requirements for their courses. You will be able to find the entry requirements for undergraduate level courses at www.ucas.com . Individual university websites also provide information on entry requirements for each course. If the course does not list information about requirements for international students, Impel will do the needful for you. Do Universities allow me to pay my fees in installments? Why do Universities collect security deposits? Security deposit is collected from intending students as Universities have come to face a problem with many students not reporting to the Universities after entering UK. This has been an issue of great concern for the institutions as well as the immigration authorities as most of such students have an high potential of becoming illegal full-time workers. In order to overcome this hurdle recent years have seen the implementation of the security deposit scheme by most of the Universities. This has become the most effective way to judge the genuineness of the intending student and also partial payment of fees and the security deposit go a long way in proving the financial status of the student for visa purposes. Financial options available to me for pursuing UK education? Apart from self savings and family sponsorship from India & Abroad the student could also avail the following options to finance his studies in the UK Scholarships-University Scholarships, International Scholarships, regional awards and other scholarships. Bank Loans-many nationalized banks are offering student loans for students undertaking studies in foreign countries. These have low interest rates and flexible repayment options and are mostly sanctioned with a few days on producing convincing collateral properties. Part-time Work- As an international student studying in the UK you are entitled to work part-time for 20 hours in a week and full-time that is 40hrs in a week during vacation. With salaries ranging from £4-£6. Thus, enabling the student to cover a considerable amount of his living expenses through this. Universities & Colleges Admission Services (UCAS) is the central organization that processes applications for full-time undergraduate courses at UK universities and colleges. What are the benefits of applying through UCAS? UCAS gives the applying student the advantage of applying to 6 different Universities on one form for a small fee. The student could also add to the 6 Universities through the clearing scheme. Can I also apply directly to the University for a UG program? Some Universities do take applications directly for UG programs but this happens mostly when the deadlines have lapsed and spot admissions are underway. Though the University might take an application directly from the student it still sends the application to UCAS to get the approval. Can Impel give assistance in applying for Scholarships? Scholarship assistance is a very essential part of our service. We would give in depth advice on applying to scholarships like Chevening Scholarship, Rhodes Scholarships etc and also provide you with information on regional scholarships, institution based scholarships and scholarships offered by Multi-national companies. Can I do part-time work during my studies? All students can work part time for 20 hours per week and full time during vacations. Jobs can be casual, temporary in nature. For e.g. :- Shops, Food joints, Supermarkets, University Departments, Libraries, computer centre, call centers etc. Sometimes the Career Services will have notices for Part time / Vacation work. What are the job opportunities after my studies? With the job market scenario widening with the influx of MNC’s in India, opportunities in India are numerous and diverse. To work in UK, students would require a work-permit to work in UK. For more details visit thewww.workpermits.gov.uk section. How does Impel help me? Impel offers you a broad portfolio of excellently managed pre-visa to post landing services tailored to the needs of the students seeking for overseas education. Moreover Impel provides you online chat with its experts and login account for the students to clarify all their queries and get latest updates and reviews regarding overseas education. 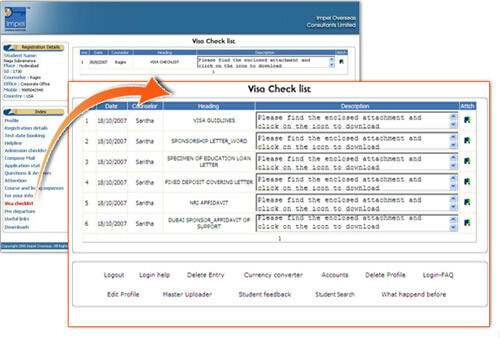 Impel processes applications for all Universities and Colleges that suits the student profile and ensures that the institutions applied for are accredited and reputed. Once students come to Impel, they need not go anywhere else as all their needs are looked after professionally. Who can be the sponsor for my Australian Education? It can be the applicant itself (self-sponsor), or their parents, grandparents (Paternal or Maternal), or spouse, or their brother or sister. Yes you can, with an option of pursuing ELICOS (English Language) course in Australia. Do the colleges accept the sponsorship from USA or UK? What are the intakes for education in Australia? The main intake is in February, while few universities commence some programs from the months of July & November. Is IELTS mandatory for the visa? Yes, IELTS is mandatory for applying Australia visa and the test should be taken within 2 years from the date of application for admission. What is the minimum eligibility of IELTS for Australia Education? When should I start my admission process for Australia? If you are planning for February intake, you have to start the admission process by September itself. And if you are planning for July intake, then you should to start the admission process by February and for November intake you have to start by June. What is the course duration for Australian education? Usually the course duration for Bachelor’s degree would be for 3 years and approximately 1.5 or 2 years for Master’s degree. If a student has TOEFL score and got admitted in an Australian university, can he go for visa? No, he/she cannot, since a score in IELTS is mandatory for visa purpose. What is the visa application fee? Where should it be paid? How long does it take to get a visa if applied in the regular process? How long will it take to get an E-Visa? Which is the main semester? Impel can help you with admission within 2 days to eight weeks, depending upon the universities! How long does the admission process take for a Diploma program? Very short. Just two days to a week max. What are the pre-requisite tests for MBA program in average universities? Aus. $ 10,000 to 16,000 per year. What are the average tuition costs for Diploma programs? Aus. $ 9,000 per year but ranges between 5,500 and 18,000.. Which are the popular courses for good employment? What is the average hourly pay for part-time students? $ 15 to $ 20 per hour, depending upon the job. Which is the most popular city for international students? What is the main criteria for students to obtain PR? Points that they obtain for their education, age and other factors. How good are Permanent Residency chances when one studies in Australia? Very good, since an Australian qualification will help in getting additional points. Does one have to be a graduate for taking the GRE? Not necessarily. However, to do a masters course, one has to be a graduate in any stream. Which score will the college consider, when I have scores from more than two tests? Universities consider the best score. The exam is held in different cities across India at Prometric Centres on all working days. There are two time slots in the day. For more details log onto www.gre.org. The charges for the GRE General Test are $205 as on 1st July 2009, payable to “ETS-GRE” in US dollars. Cost of each GRE Subject Test is US $ 150. 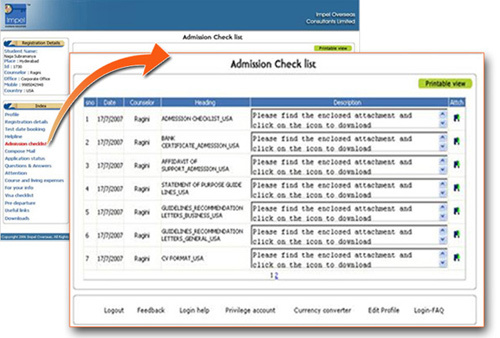 The universities only accept official scores sent directly by ETS. Scores to four colleges can be sent free of cost,while taking the exam. Subsequently, for each score report sent to a college, you would have to pay ETS $ 20. The GRE subject tests are specialized tests, to be taken only if your university asks for it. Check with them. In India, Subject GRE® is offered only once a year, in November. How much does the TOEFL cost and what is the advantage if I register with Impel? In India, students have to take Internet Based (iBT) TOEFL which costs US $165.When you register for TOEFL at any of the Impel””s offices, you will get a concession of US $ 10 and have to just pay US $ 155 only. To take the test with the British Council in India you can either register online/offline. Impel is an authorized center for Test Date booking for British Council and candidates can register through Impel in-order to appear for the test. How much does the IELTS test cost and what is the advantage if I register for IELTS at Impel offices? The fee for IELTS test varies from time to time. Currently the fee is Rs 7200, if paid at The British Council offices and Rs. 7,400 if the fee is paid with a credit card at IDP Education Australia offices throughout the country. If you register for IELTS at any of the Impel offices, you will get a discount of Rs. 100. From 1 January 2007, the policy on candidates re-taking IELTS has been amended. The restriction on re-taking IELTS within 90 days has been removed and candidates will be able to repeat the test whenever they wish. It should be noted however that IELTS scores are not substantially improved merely by taking the test on multiple occasions. To significantly improve a score it is necessary to engage in further study of a serious nature. Gain score studies carried out under the IELTS funded research programme indicate that scores are unlikely to improve dramatically without extensive English language tuition in the interim. You need to bring your passport, hall ticket and stationery for all the modules of the test. If, you have registered online then you also need to bring a colour passport-sized photograph on the day of the test. The Listening, Reading and Writing tests are all taken on the same day. The Speaking test can take place up to seven days before or after the other papers. It is usually within one day of the Listening, Reading and Writing tests at British Council India. This depends on the receiving institution. Two years’ is the normal period of acceptance. 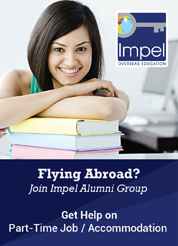 Impel overseas is a one of the top consultant companies in the field of overseas education. Impel is assisting hundreds of students to reach their study destinations. With excellent infrastructure and highly trained, committed and professional staff, Impel helps you in every situation. . Impel is a one-stop service provider that processes applications for all the universities that matches your profile and ensures that the institutions you have applied are accredited and reputed. Click here for more information on Why Impel. Is Impel an accredited company? What are the services that Impel offers for me? What are the auxiliary services that distinct ‘Impel’ from others? 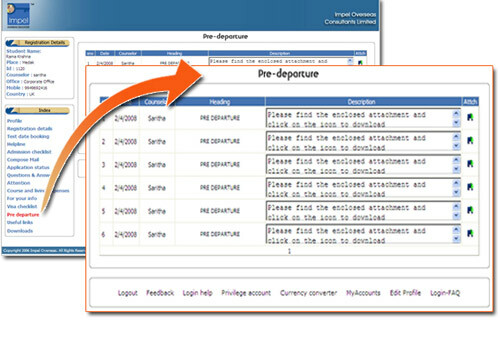 How does Impel make my visa processing easy? 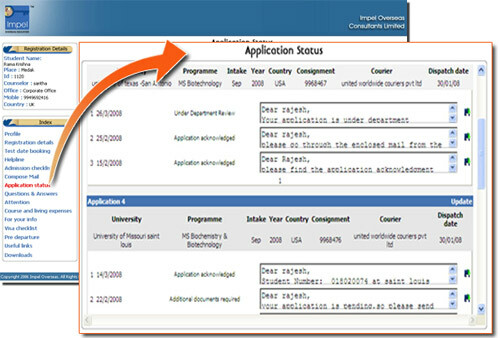 Impel processes applications for many Universities and Colleges as a single window service that best suit to your profile. Besides it ensures that, the institutions you have applied for are accredited and reputed. Once students come to Impel, they need notworry about anything else and all their needs are looked after professionally. Impel student login provides online access to the details and information that you require right from the day of your first contact with Impel to the pre-departure stage where you actually prepare yourself to leave to your dream destination and explore your new horizons. What all do I receive from Impel student login? 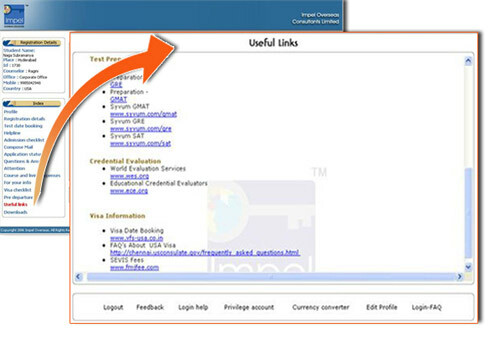 How to register online for Impel Student Login? 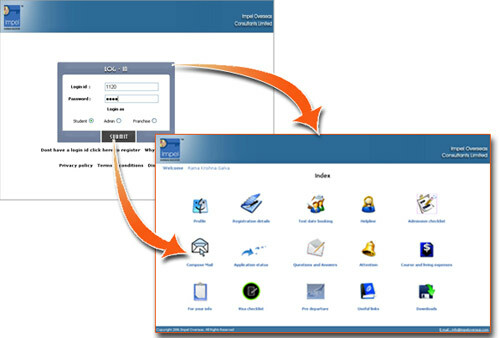 Online registration of Impel student login is very easy. You just have to provide some general information about yourself and start accessing our services. For more convenience you can look at the Sneak Preview in the website. Does Impel provide discussion forums to the students? There are several discussion forums joined by hundreds of Impel students belonging to different communities. They discuss about various academic programs and about the country overviews of their study destinations. I am not a Hyderabad resident, can I still apply? Yes, you can take advantage of our services from any part of India though you’re not a resident of Hyderabad. Impel also facilitates its services to the students from our offices localted throughout the country. As Impel has online servicing system it is easy to avail the services for the students staying away from the office. Where is Impel Overseas Consultant located? The corporate office of Impel Overseas is located in Hyderabad and is coming up with several offices in different places of India, with an intention to spread its wings across the country. Impel provides you a good mode of searching for a course of study that as preferred by you. The ‘Course Wizard’ has a huge database of various courses and universities of several countries. Thereby, you can easily find an appropriate academic program of an accredited university in an immense country. Find Your Course – Course Wizard. Impel is facilitating Campus Locator for the students to locate the university campus chosen by them. It enables you to view the locality of the campus and its environment, so that you can get awareness about its neighborhood before you reach there. This is powered by Google Maps. Click Here to view. I came to know that Impel is offering Free SMS service, is that true? Yes, Impel is providing free SMS for every individual. You just have to fill a small registration form regarding your general information like, name, email ID, phone number and start sending free SMS to anywhere in India.